The Land Bank purchased the Dean Road house in June of 2005. It was in pretty rough shape but oozed potential. Thankfully, in 1999 the house had been put on a new foundation. With a total of only 3 weeks to close on the purchase this new foundation is what sealed the deal for the Land Bank and for Vancity as it added potential living space. The few renovations detailed in “Historic Building” were the extent of the upgrades to the building before the Land Bank purchase. 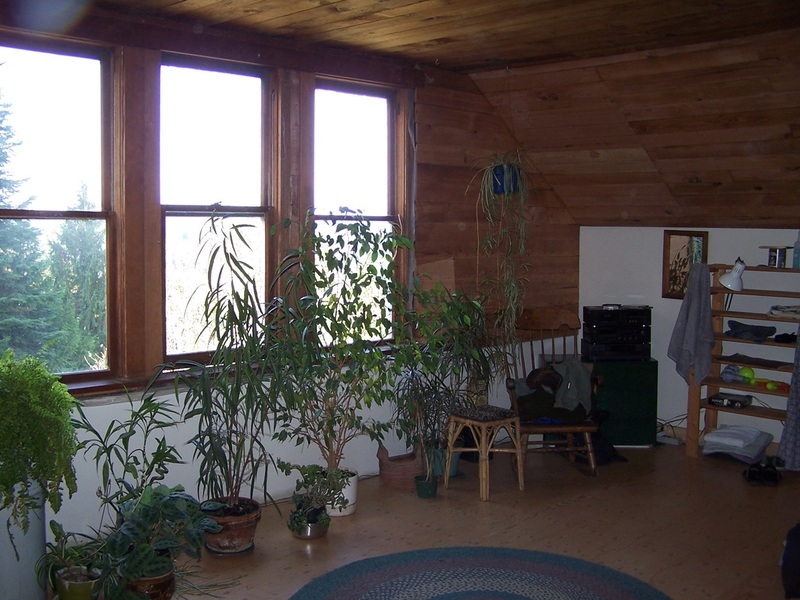 The floors were crooked from a previously sinking foundation due to roof leaks and poor drainage, doors were cut down on angles to fit openings after the jambs had sagged, the roof leaked into 2 bedrooms, there was no heat in some rooms, and you could see daylight through many walls. 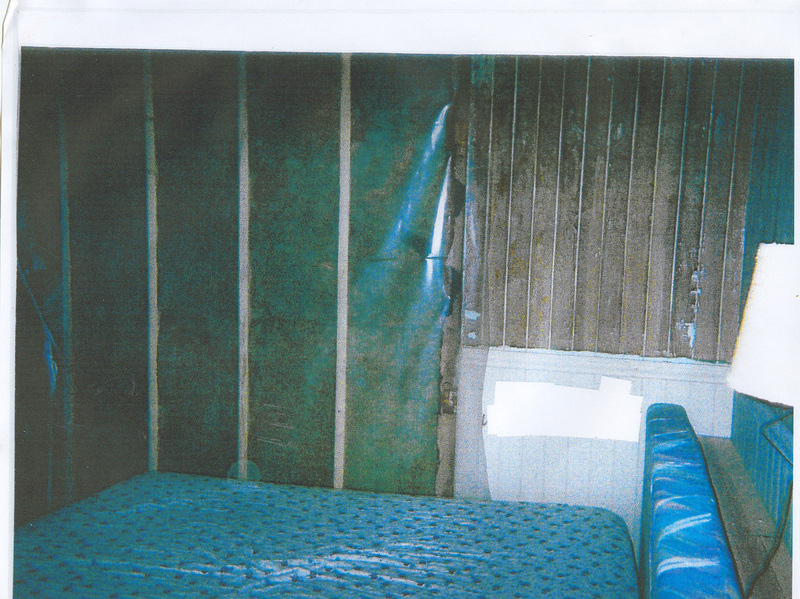 It had single glazed windows, virtually no insulation and we won’t even discuss the kitchen and bathroom. The lack of upgrades made it less complicated to work on. Under a few layers of sheet lino were untouched original fir floors. Also, because the building had been allowed to sink in place without messy structural supports trying to combat the downward march of the foundations we were able to jack up the building to level it relatively easily. Immediately upon purchase the entire septic system was redone, including a sand filter as type 3 wastewater treatment . SS Volunteer Fire Fighters Association donated funds to put in the insurance-required smoke alarms and also baseboard heat in rooms with none. 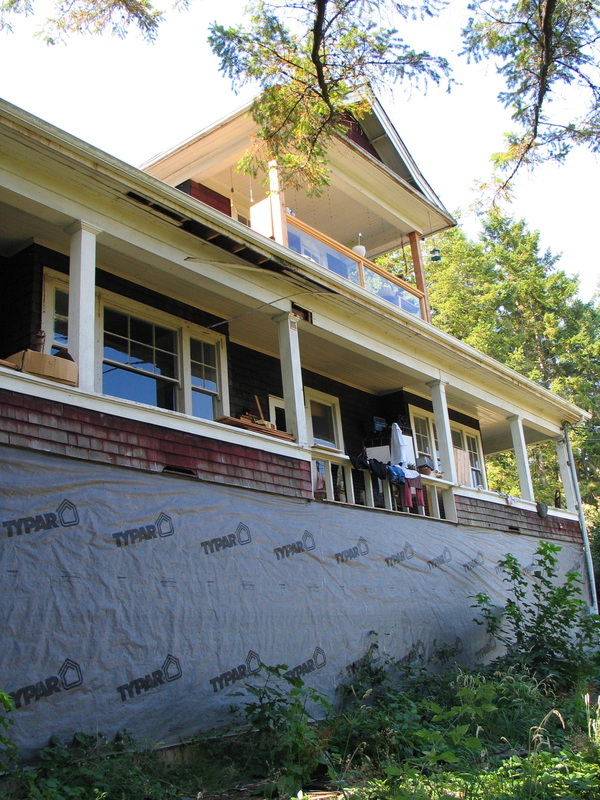 Slegg and Windsor pitched in with materials to restore and sound-proof interior walls and break the giant living room into 2 bedrooms, each with windows onto the deck. SS Foundation supplied the funds to ‘winterize’ the house, fix up the bathroom and add another toilet and sink. 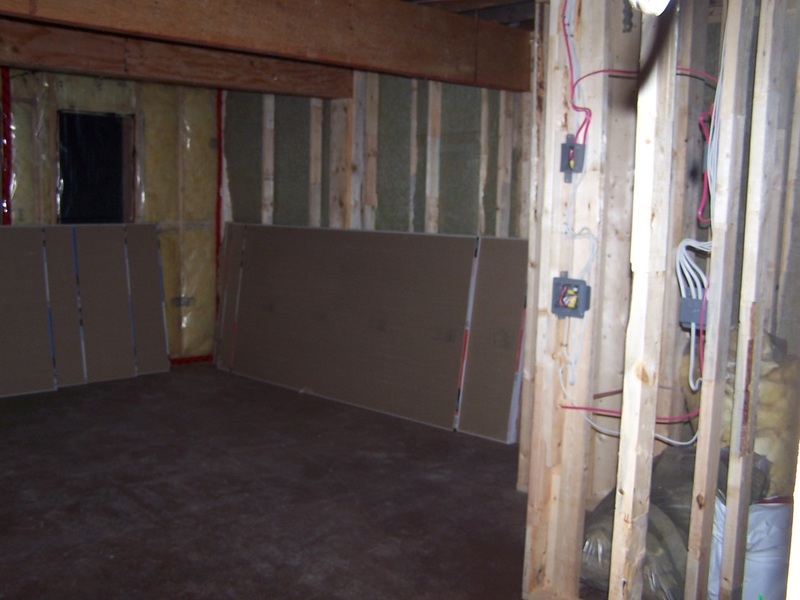 Winterizing consisted of an air barrier where the wind just whistled through the walls and ceiling; this air barrier had the added effect of bringing the hydro bill down to an affordable price. Most of the tenants that were living in the Dean Road House at the time of the purchase, stayed on through the first year and into the beginning of the major renovations the next summer. The Land Bank got a grant from CMHC and an increased mortgage from Vancity to undertake a major renovation. It started with structural repairs, a new roof and nice bathrooms. Some rooms were occupied during this time of major renovation. When prospective tenants arrived it was easy to see if they might become part of the household: they had either been brought up in renovations and were excited by the process, or they were mortified. Tenants moved around from room to room as we worked. The exception was several rooms that had to be completely gutted and remained empty throughout the duration. The lower level has a coloured slab with in-floor heat and consists of 3 large rooms with bathrooms. It was designed to become separate suites one day, requiring minimal further renovations. It has been inspected for multi- family use (requiring thicker drywall and materials like rock-wool) to provide greater flexibility should rezoning be sought and permitted. 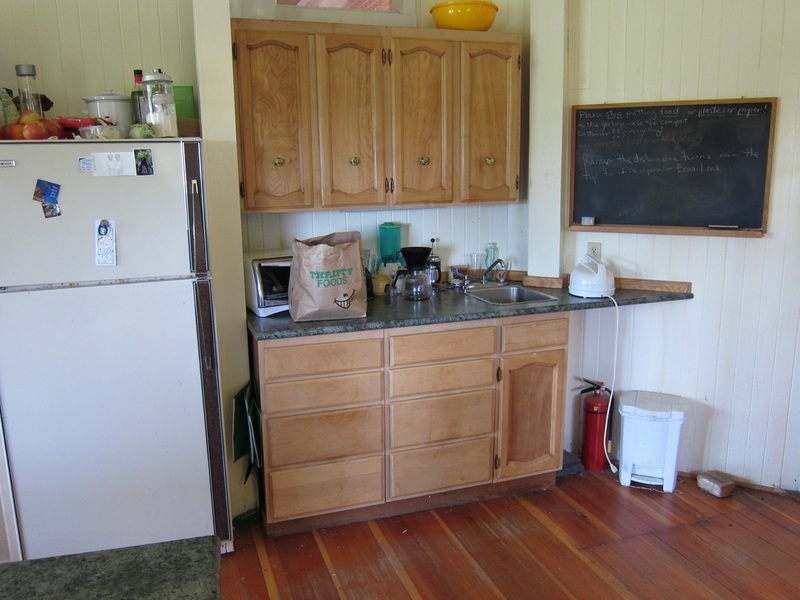 This house was the first affordable housing on Salt Spring Island that was not geared to seniors.